Fight Toxic Prisons celebrates Herman Bell’s Release! I’m calling to bring to your attention an illegal effort by prison officials to terrorize an Ohio prisoner. The prisoner, Sean Swain, is a model prisoner, a published writer and a radio personality on a globally-syndicated radio show. Because Sean exposed how prison employees who were directed by ODRC Counsel Trevor Clark intercepted and stole Sean’s mail from courts to hide their crimes, prison officials have shut down all of Sean’s communication to the outside world…to his family, his friends, and even to the courts. Prison officials are blocking Sean’s phone, email, and even regular mail. Their goal is not just to silence him, but to cut him off from everyone who loves him and drive him to suicide. Oh, and Former Black Panther Romaine "Chip" Fitzgerald Denied Parole after 49 Years - parole hearing postponed for five years, ffs. Long-term Black Panther/BLA prisoner Jalil Muntaqim coming up for parole, letters in support requested. Also, not generally into promoting PSL-led events, but the rally that happened at the weekend outside Lee Correctional is notable for being in a location that really doesn't have a strong tradition of outside IWOC/ABC-type organising. After 47 Years Behind Bars, Will Jalil Muntaqim Go Free? The 17 Vaughn prisoners charged in connection with the 2017 Vaughn Prison Uprising are suffering brutal repression on a daily basis. The guards and the whole carceral apparatus are trying to break them. Let’s call in on July 2nd to stop the torture. J20 cases continuing to collapse all over the place. Update and call to support IWOC member and long time prison organizer, Malik Washington. It's been six months since we posted this campaign and, thanks to you, the Bay View newspaper is still alive ... but once again we're in urgent need of your help to stay in print. The company that prints our paper not only does great work but has always given us lots of credit. Now, however, they're insisting on our catching them up. We were three papers behind, have now paid for one but have $7,000 still to raise before we can print another paper. Please help if you can and, even if you can't, please spread the word. 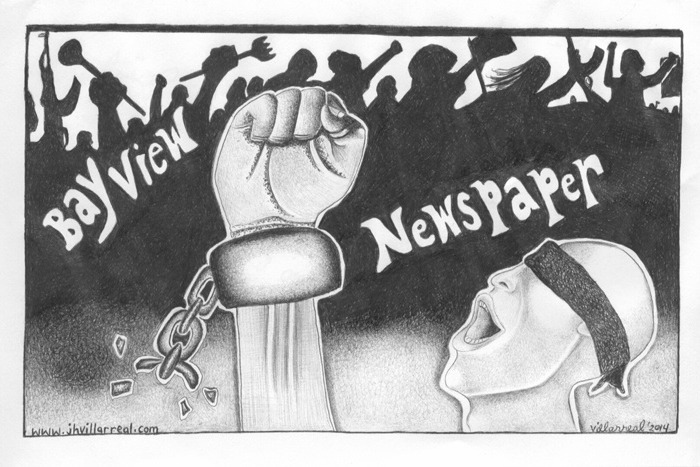 Enjoy this drawing by Jose Villarreal, then a prisoner in the notorious Pelican Bay State Prison Security Housing Unit (SHU), where prisoners were held indefinitely, some for decades, in total isolation; their way out was through the three largest hunger strikes in history, with 30,000 participants at their peak. Jose and others drew pictures and wrote stories to keep spirits up during the months the prisoners starved themselves, and the Bay View published them. We're so proud of their victory, and especially of Jose, who's back home now in San Jose, working as a dishwasher and spending all the rest of his time as an activist, helping and advocating for the most needy. That's some of the work the Bay View does, and we're very grateful for your help. 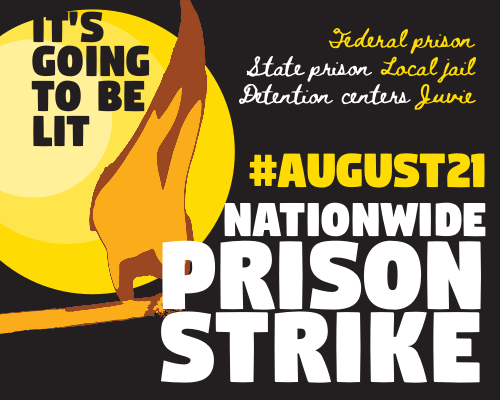 I'd really recommend people donate to their fundraiser if you're able to, with the August prison strikes coming up, a pro-strike newspaper getting into prisons around the country this July/August would make a huge amount of difference. 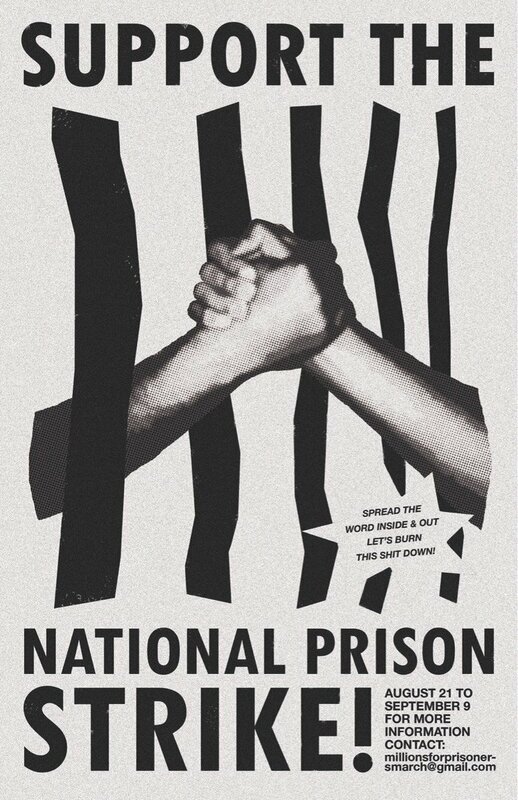 Week of International Support in Lead Up to Nationwide Prison Strike: This is a challenge to every anarchist, abolitionist, rebel and determined fighter against prison society and white supremacy in Amerikkka: Between Monday, July 16 and Saturday, July 21, we’re calling on you to help unleash a concerted and spectacular array of solidarity actions before the upcoming prison strikes! Imam Hasan, a Lucasville prisoner and major organiser in the 2016 strike who was sent to solitary on clearly bogus charges that he tried to get someone to carry out a suicide bombing in support of the strike(!) has just been thrown into solitary again, phone zap called for Monday 30th to try and get him out. We are digging for more information now, but please be prepared for a phone zap Monday morning. This event will be updated with more details and a call in script by then. In the meantime, write letters of support to Hasan and get them in the mail today so that he and the staff who have targeted him know that we are mobilizing in his defense. Imam Hasan told us that most of his property has been confiscated. He has no pen, paper, kites, envelopes, stamps, or legal work. A security barrier with sandbags is outside his cell door (presumably to prevent anyone from passing anything to him). SUGGESTED SCRIPT: "Imam Siddique Abdullah Hasan (R130559) has been on hunger strike since July 28, 2018 to protest the conduct report he was issued by Brian Wittrup. We support Imam Hasan because speaking about a strike over the phone is not a "business operation" or inciting a "riot". We need you to drop the charges, meet his demands, return his property and reinstitute his previously earned privileges." I need people to call the BUREAU OF CLASSIFICATION, MR. WITTRUP. Ask him why am I being held on a disciplinary version of population without the full privileges of my level such as a rec. yard, gym, chow hall, and many privileges at the same level anywhere else are rule violations here. Ask him what's the plan what's the timeline for moving me out of here. As most of you know it's been 20 plus years stuck here it's time I go! "We've just received word that Michael was beaten by guards and is currently in lock up. No other information at this time, but we will keep this space updated with what information we get. Please call Holman Prison at 251-368-8173 to ask about Michael's whereabouts and demand his release. It's important that prison guards and management get reminded that they can't abuse people unnoticed or with impunity. The warden is named Cynthia Stewart. Just received word that Michael is in "severe condition." More when we know it. Please keep calling the prison! Holman Correctional Facility is not releasing his condition, let us flood the Commissioner of Prisons lines and demand that they release Michael to an actual hospital that will help him. The # to the commissioner's office is 334-353-3870, ask to release Michael Kimble from Holman Correctional, AIS 00138017. FREE ALL POLITICAL PRISONERS, RAZE THE WALLS"
New audio on the strike from Rustbelt Abolition Radio and Kite Line (Kite Line's hosts seem to not be GDPR compliant or something, so EU people will need to use a proxy to listen to the latter). Black Panther/Black Liberation prisoner Robert Seth Hayes makes parole, having been held since 1973 and faced serious medical issues in recent years. "I'm understanding that people in segregation at McCormick prison are being humiliated and being forced to walk around a metal pole with just their boxers on and being paraded around even in front of women officers. Even the Muslims who are religiously required to cover certain parts of their bodies are being denied any way to cover themselves. It is causing a lot of tension and creating a dangerous situation." Should also be possible to email him at stirling.bryan@doc.sc.gov. 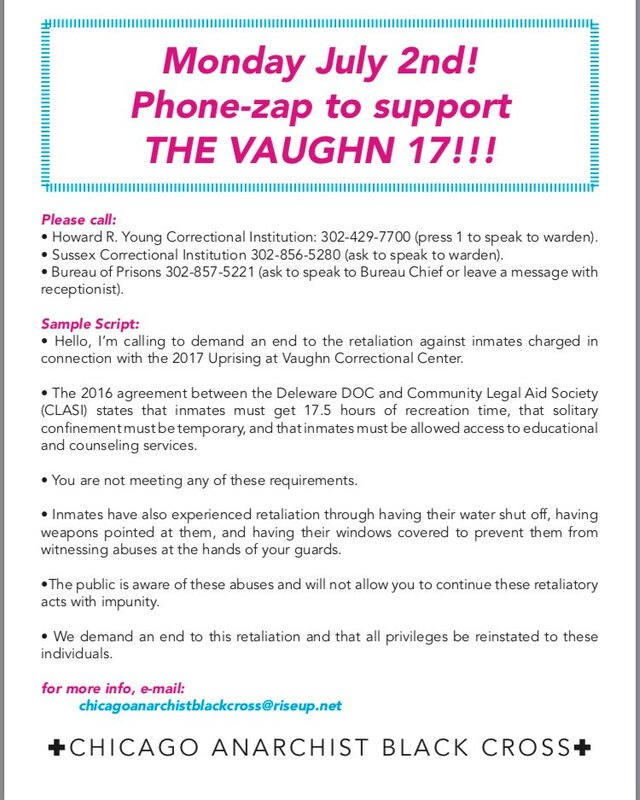 Phone Zap to Get Malik Out of Solitary! Eric King’s Communication Restricted: Call in to Help! Eric is still being held at USP Leavenworth after being assaulted by staff at FCI Florence. He still is being held without charges, disciplinary write-ups, or any disciplinary hearings for more than 140 days. He is still under the jurisdiction of FCI Florence and this month when he tried to call his wife for his one phone call a month he found that their communication was restricted and he was unable to call. EK remains without an explanation as everyone refuses to provide any information as to why his phone communication has been cut off. This is incredibly problematic not only for Eric and his family for all political prisoners. If the BOP is able to block communication with Eric despite laws and regulations what is to stop them from restricting communication of other political prisoners from their support and family. Eric is being held in absolute segregation without even a cellmate at USP Leavenworth and has been now for over 137 days now. This added to his previous time in isolation makes his time served about a year of his total prison time which is very traumatic and triggering. Eric is still dealing with the emotions that have resulted from the incidents that took place in Florence as well as that he has been unable to see his family for over 4 months now. He has missed holidays and birthdays. The day he was attacked was the day following his wife’s surgery for cancer therefore he has missed being able to process subsequent medical problems with her. He is faced with the realization that for the remainder of his sentence he will be far from his wife and kids. The letters and support he has received has been amazing and he is so thankful. While he processes the trauma and grief we ask that you stand with him and continue to show support. We ask that folks call as often as they can and to as many offices as they can. Take a block of time and call the same number over and over, request difference staff’s voicemail. Get creative but show them that we are watching and ready to protect our friend and comrade. We got word that Eric was planning on going on a hunger strike beginning yesterday if he didn’t have answers. As there is a prolonged delay in mail right now he may have already began. If this is the case it is so important that we hit the phone lines as hard as possible on Monday. Ask for: The warden/assistant warden, the legal department, Counselor Quintana, Counselor Rivera. If denied demand the person answering the phone take down a message. Ask for: Director Jeffrey Krueger. If denied ask to speak with his assistant. If denied again, demand the person answering the phone take down a message. Hi I am calling about Eric King, #27090045 to demand that his phone restriction be lifted. It is unacceptable to take away a prisoner’s calls to his wife and family without any notice and without him being brought up on any charges. Thank you for all of your help and continued support! "Update 1/16/19: On the fourth day of his hunger strike Eric was able to get a five minute call to his wife in exchange for eating dinner on 1/14/19 by negotiating with the prison. He has been standing strong and is in good spirits. He has definitely sent the message to the prison that he is backed up by our support on the outside. He has shown them that he is motivated and that he will see this out. The lower level administration is desperately trying to find answers for him as to why Leavenworth restricted his communication with his partner. It was explained to him (as our research showed) that for a prison to restrict a spouse’s communication there is a complicated process that must be followed; we know that this was 100% not done.Yesterday the executive assistant at Leavenworth gave false information saying that Eric was informed on November 20th, 2018 at 12pm (an oddly specific and arbitrary time and date) that the communication restriction was being put in place and why. This is a blatant lie. Both Eric and his Lieutenant were shocked by this information because no one else at Leavenworth seems to have this same understanding. It seems that the warden, the executive assistant and only upper-level staff at Leavenworth have this information and they are doing whatever they can to keep it and cover it up (likely because they know that the proper processes were not followed). They have gone so far as to ‘lose’ two of the grievances EK filed in the last two months trying to get information.Their time is up. We are sending (with your help!) an effective message to the prison that we are watching and we are going to make their lives hell until this is fixed. That Eric is not standing alone in this. They know now, after negotiating with him and getting him to eat only in exchange for a 5 minute phone call with his wife, that he will continue the hunger strike until the lines of communication are open again. Eric resumed the hunger strike the next morning. We need the community to continue to stand strong with Eric and keep making phone calls. Thank you all for your continued help and support." "We are taking a next step in that struggle, bringing in power from supporters outside to cancel prison labor contracts with government agencies. Will you join us again?